OCP is a Christian organization that welcomes people of all spiritual understandings. Art is one means to universal connection, which is so rare in our increasingly polarized life. As we near the end of this turbulent year, we’d like to highlight two of our community members, siblings Jai Mossow and Christina Robin Gordon. 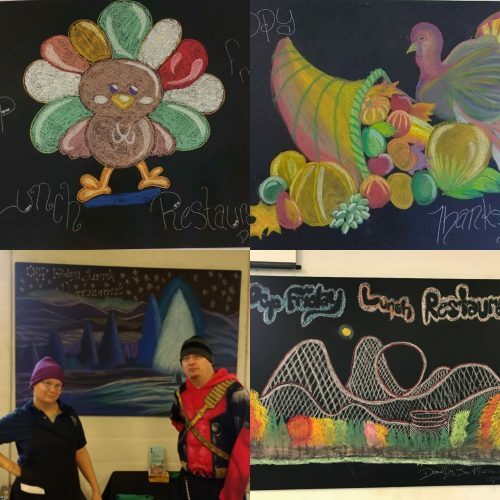 They have come out of their shell and used their artistic creativity to fire up the energy going on at OCP, whether among community members or Friday Lunch Restaurant patrons. Two of three siblings from Newport News, VA, they first came to Harrisonburg in 2004. “When we first walked into OCP in 2008, it was like a warehouse. Nothing looked the way it was today,” Jai and Christina said. Christina had heard that OCP was an organization where she could make friends and through volunteerism learn how to engage with people other than close relatives. Jai thought of OCP as a place where he could express his creativity and get feedback. I asked Christina, “What is art for you? What benefit do you get from drawing?” She said it helps her focus, be creative and find a peaceful, calm way to express what’s happening in life, and find her strength. The artwork that our featured volunteers have gifted to both OCPeople and the public has both illustrated and inspired gratitude, showing their thanks for the space offered to them while providing beautiful work so many admire. I personally get so absorbed in their images each week. “Customers at the Friday Lunch Restaurant and Night Out have said, ‘wow, that is so beautiful and amazing. You are so talented!’” Christina smiled. Jai mentioned that community member Ina ended up crying happy tears in response to his portrait of her. Amidst her grief, volunteer Jennifer Mackey asked Jai to draw a portrait of her and her late husband; she loved it so much that she framed it. By bringing the picture to life through drawing, Jai provided a sense of comfort and continuity of life. OCP encourages community members to express themselves and use their gifts. 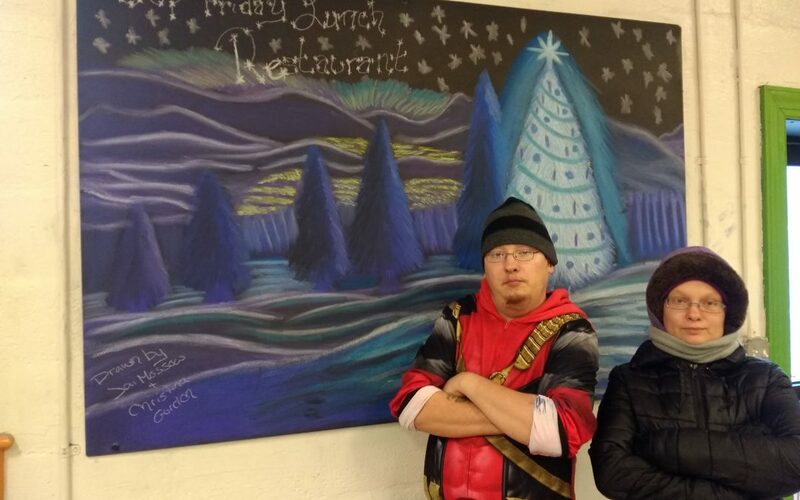 These two volunteers have shared their creative gifts to engage everyone who walks into OCP in our atmosphere of safety, spiritual awareness, healing and fun. I love this blog thanks leons for doing such a great job on it! !